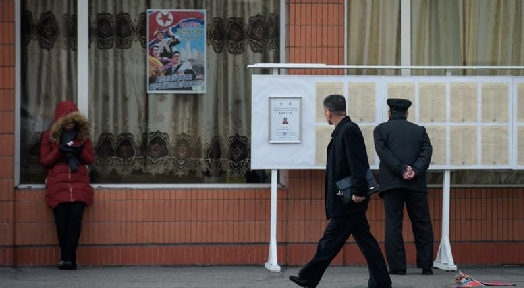 Turnout in North Korea’s single-candidate election was 99.99 percent this year, up from 99.97 percent the last time it was held, state media reported. This year’s turnout fell just short of 100 percent as those “abroad or working in oceans” were unable to take part, North Korea’s official KCNA news agency reported on Tuesday. Millions of North Koreans voted in the national polls on Sunday. The election is held every five years to elect what is widely seen as a rubber-stamp legislature known as the Supreme People’s Assembly. With only one approved name on each voting slip in the isolated country, which is ruled with an iron grip by Kim Jong Un’s Workers’ Party, the result is never in doubt. But the list of 687 elected deputies reported by KCNA did not include Kim, raising speculation about the reason for his exclusion. State media did not mention Kim’s candidate registration before or after the elections, South Korea’s Yonhap news agency reported before adding that the decision does not appear to suggest that his grip on power is slipping. Kim was last elected to the assembly in March 2014 when the first election was held since he came to power, running from Mount Paektu, constituency number 111, a mountain known to be the sacred birthplace of his late father. Sunday’s elections, like in 2014, saw results come 100 percent in favour of all named candidates. “All the electors participated as one in the election to cement our people’s power as firm as a rock,” KCNA said, citing a report released by the Central Election Committee. Kim’s younger sister and close aide Kim Yo Jong was among the newly elected, said Yonhap.